Christmas is a time unlike any other. On the big day you have specific food you’re meant to eat. Films are made to only be watched at that time and music exists that when played at any other time of the year is just a bit odd. It’s always surprised me then, that when I grew up there were so few Christmassy games. With the invention of mobile gaming (and the resurgence of fast turnaround indie games) this isn’t the case, but as a child there were just a handful of specifically festive games to be enjoyed. One that did get played each year (and only at Christmas) was James Pond: RoboCod. 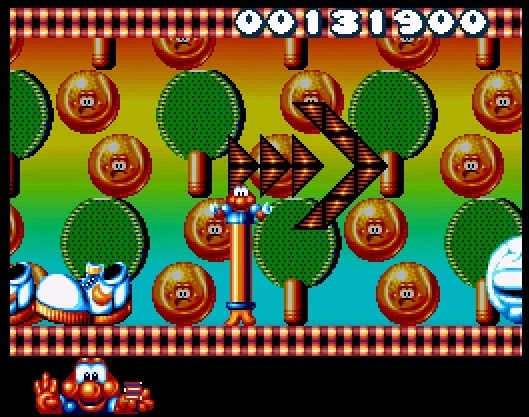 I must confess I didn’t have it on the Snes, but instead on its native Amiga – but its popularity meant that it was successful enough to be ported to any system that could handle it. RoboCod actually marked the second outing for James Pond. 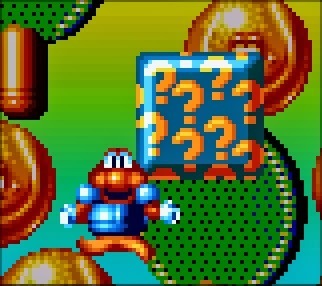 He first appeared in an Amiga game in 1991 as an obvious parody of secret agent 007. 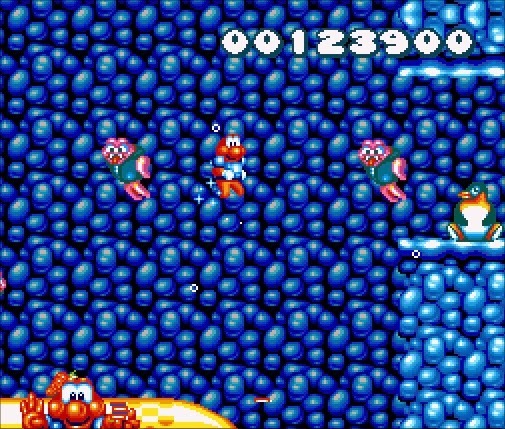 Instead of the usual run and jump affair, this game saw Pond swimming around various levels, rescuing hostages, finding keys and capturing enemies in bubbles. The first in the series sold moderately well, but it was RoboCod later that same year which became one of the best games on the Amiga and the first real console-like experience on the home computer. “In the early months of working on RoboCod I had just discovered 16bit consoles.” Sorrell notes. 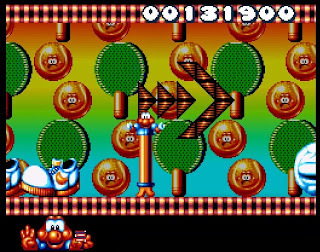 “I instantly fell in love with Mario [World], and, yes, I wanted to try and capture some console goodness on the Amiga. It was definitely a case of making the kind of game I wanted to play.” Sorrell really is the voice of authority on RoboCod, acting almost like a one man ‘bedroom coder’. 70 per cent of the coding and graphics are attributable to him, as is the entirety of the game design. You can’t help but wonder if this was the best thing however, as some of the ideas seem to drift quite close to the abstract and bizarre, with a sense of humour that didn’t always translate well outside of Britain. Ignore this arrow and head left... trust me! to a number of whimsical stages or oversized boss to be beaten before you can progress further along the castle. Although essentially linear, it is a nice way to pad out progression and makes for a vaguely calm respite from the zany levels within. This hub is also home to a few memorable secrets, such as collecting power-ups in a specific order to spell ‘Cheat’ giving you access to every level and infinite energy for 15 minutes; long enough to complete the game should you know the correct routes. 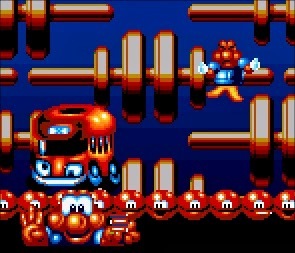 RoboCod is of course best remembered for its main game mechanic, a main character with a modified robotic body that extends upwards to great lengths. This quirky (and never since repeated) ability allows him to stretch vertically to grapple any platform above. Pond can then navigate around the maze like levels, bypass spike pits and accessing new areas and expose hidden secrets. 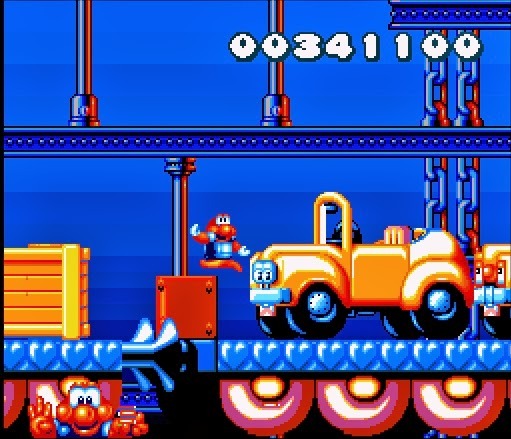 These stages see RoboCod tackle possessed toys; playing cards that fly around, angry ginger bread men and toy Red London buses that fire miniature grannies. It’s all products of Sorrell’s oddball mind; a deliberate attempt “to come up with the craziest stuff [I] could; I think the fat ballerina was one of the most notable.” The locations too ooze imagination, such as a level that takes place on a sheet of music and one that requires a climb up a mince pie tower. Level aesthetics are consistently creative, with platforms lined with soft fur, Christmas cake and bubbly chocolate, and often with a colourful occasionally blinding psychedelic background. There is never a danger of the stages blurring into one. The aim is to explore each level collecting as many objects as you can. These vary from fruits to random objects such as taps globes or tennis rackets. To pass a level you need to touch the flashing ‘north pole.’ However, it will only flash if you have collected all of the hidden penguins in the level. This need for exploration highlights the major problem with the game; its level design. Initially, it's not an issue, a generic left-to-right affair with some vertical scrolling. However, about a third of the way into the game, you encounter more complex maze like worlds. The stages in these are far too long; apparently the game boasts over 2,500 screens of play. 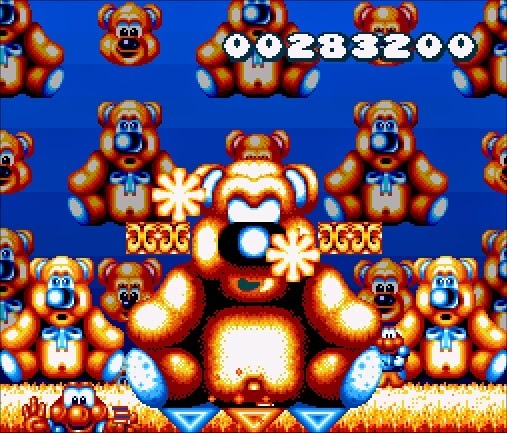 Later levels are also filled with cheap shots, unfair enemy placement and far too many ‘platform over spike’ sections. It becomes very vague where you have been and where you need to go, and a simple addition of a counter saying how many penguins remained to be found or a map would avoid a great deal of un-necessary backtracking and risk taking. This was why perhaps I would quit as a youngest half way through the game – no doubt distracted by the prospect of watching ‘Santa Clause: The Movie’ with Dudley Moore. This wasn’t helped by a lack of a save option or passwords. If you don’t complete it in one session, you have to start from scratch however far you managed to get. It's a shame I stopped because the game actually improves as it progress, with the most interesting levels found at the end (the bathtub stages in particular). Indeed this play through was actually the first time I ever saw the Father Christmas ending. After all the madness of the game, seeing Jolly Old Saint Nick crush a Bond style arch villain with a bag of toys while a cybernetic fish jumped perpetually seemed perfectly normal. Its best not to worry about what Santa may deliver, considering he left his sack on the body of a foe back at the toy factory. Compared to the Amiga version I remember so fondly, this Snes conversion still plays well, but there's a huge amount of frame rate concerns. Some levels (such as those under water and those with flying sections) are pretty much constantly plagued with fairly serious slowdown. 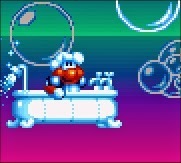 Likewise when RoboCod is extended too much the game grinds almost to a halt. Another quirk of the Snes version is the strange fact that all the upside-down stages have now been flipped so that they're now the right way up. 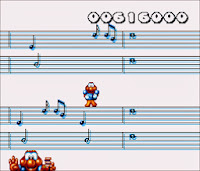 I distinctly remember trying all sorts of methods to play these levels as a youngster, standing on my head, holding the joystick upside down, but now they are curiously normal stages. It’s no doubt for the best as standing on my head really isn’t practical now I’m twenty years older and playing on my ‘commuter computer’, but still it’s a shame as I remember them being rather enjoyable in their original form. I have to applaud a game eager to keep inventing bizarre twists on traditional themes, mixing them together with little regard for the platform genre rule book. There’s plenty of secrets tucked away on each of the sometimes too enormous levels. (Cheap deaths aside) there’s much fun to be had exploring the majority of the game, especially when you never know what kind of ridiculous enemy might come at you next. It’s a shame that modern audiences care not for this world of fish puns and bizarre psychedelic stages. An over ambitious KickStarter campaign to reboot the franchise got pulled after receiving just over a tenth of its funding goal; proof if it were needed that as a character James Pond has faded into obscurity over the years. But in its day it’s almost comical how entranced reviewers seem to be by RoboCod. “It is bloody brilliant” enthuses Amiga Computing, “It is one of those games that just spurts playability and general loveliness out of the monitor and all over your lap.” The game in its original form had almost unanimous 90% scores in Amiga games magazines. 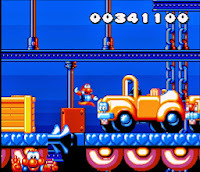 I don’t know if this was due to a lack of quality when it came to platform games on the computer, but it certainly is nowhere near the greats on the Snes. That’s not to say I didn’t find it very enjoyable to play now. Maybe it was the late, great, Richard Joseph’s catchy Christmasy music, and the level tunes that’ll be perpetually etched on my heart. Perhaps it was the eccentricity or colourfulness but playing RoboCod gave me a warm feeling inside, the likes of which you only get from childhood nostalgia or from warm mince pies on cold evenings.